The search is underway to select a host farm for the Deer Farm Demonstration (DFD) Project that will start in Spring 2014. The DFD project is part of a two-year initiative to raise the knowledge base across Scotland’s farming sector about the production of venison and breeding stock from deer farms and parks. Year 1 of the project will comprise five demonstration days spread evenly over 12 months with presentations, hands-on workshops and training, and the opportunity for those interested in diversifying into deer farming to meet experts from the sector. The five demonstration days will cover many aspects of the deer farming year, plus talks from specialists on finance and funding, fencing, deer health, the market, butchery and more. 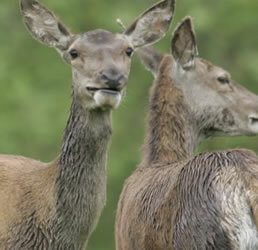 The project is a joint initiative by Scotland Food & Drink, the Scottish Venison Partnership, NFU Scotland and SFQC Ltd. It is supported by the SRDP Skills Development Scheme which is jointly funded by the Scottish Government and the European Union. In September 2013 on Scottish Venison Day Richard Lochhead MSP, Cabinet Secretary for Rural Affairs and the Environment, announced a £95,000 grant towards the project which has a total price tag for delivery over two years of around £130,000. The move to increase production of farmed and park venison from Scotland comes at a time when the UK market for the meat is steadily growing – some estimates have put growth as high as 25 per cent per annum. However, a Scottish Venison Partnership forecast shows that even if the UK market grows at just 10 per cent per annum for the next 7 years, and production volumes increase by 5 per cent, UK imports of venison from New Zealand, Poland and elsewhere will still double over that period to meet market demand. This is in part due to the fact that Scotland’s wild red deer cull, from which the bulk of our domestically produced venison comes, is static. It is estimated that Scotland currently produces around 3500 tonnes of venison per annum of which just 50 tonnes comes from deer farms. The target is to increase production from deer farms to 1000 tonnes per annum by 2020. Year 2 of the project in 2015 will move on to deer park production with a similar programme of 5 demonstration days to be held at a deer park which will be selected in due course. e: mail@scottish-venison.info for more information. Farmers and other rural businesses interested in early registration to attend the demonstration day programme can do so by making contact (as above) also.